I’m going to destroy the forest. But I’m only going to do it once, so try to pay attention. The second adaptation of a William Joyce book in as many years (The Leaf Men and the Brave Good Bugs), Epic’s eco-fable in miniature has considerable merit. It is structurally more satisfying than Joyce’s fairy-tale-characters-super-team Rise of the Guardians (that movie wastes its high concept premise). Yet it suffers from an inability to trust in its more distinctive (better) ideas. The production team clearly felt it necessary to punch up the proceedings with standard animation plot devices and supporting characters, which cumulatively neuter the movie as a whole. Maybe they were right; maybe the idea wasn’t sufficiently “exciting”. Epic didn’t do a whole lot of business in comparison to the more popular Pixar and DreamWorks animation brands (although the latter met with double disappointments over the last 12 months; both Rise of the Guardians and Turbo significantly underperformed). Blue Sky Studios, the animation house behind Epic, is owned by 20th Century Fox (who, somewhat greedily, also struck a distribution deal with DreamWorks this year) and has seen extraordinary success with the Ice Age franchise. Their other pictures have been less prolific; Rio was a reasonable performer but, as with all their pictures, it did considerably better internationally than in the States. 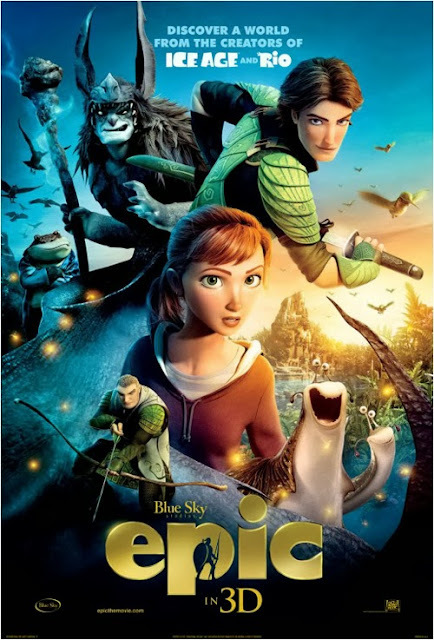 Chris Wedge, VP of Blue Sky, is a multi-tasking producer, writer, and even actor (he voices Scrat in the Ice Age films) but Epic is his first directing effort since 2005’s Robots. And it shows similar signs of Robots’ rocky road of development, banging a less standard idea into a more homogenous shape. Wedge himself admitted he was pushing readily identifiable touchstones on a young audience attuned to a diet of sequels and anthropomorphic sidekicks when he referred to Joyce’s story as “quaint” and said they had turned it into a “gigantic action adventure”. Presumably this was with Joyce’s full endorsement, since he is one of the six credited writers (his involvement in the movie world extends as far back as Toy Story). Joyce and Wedge earlier collaborated on Robots, making it even more likely that he is sanguine over the financial necessities of distorting a text from its original shape. The most notable name on the writers’ list is James V. Hart, whose career (mostly literary adaptations) has taken in highs such as Contact and The Last Mimzy and lows including Hook and the second Tomb Raider. Perhaps he was called on to take a pass at the tale’s message (since it is more-often-than-not a pre-eminent feature of his scripts) while Tom J Astle and Matt Ember handled the slapstick and sight gags. Either way, one gets the impression there was the potential to envisage an environment as potent as, say, The Dark Crystal. Joyce’s take on the natural world is one of a struggle between decay and growth as personified by the frightful Boggans and the goodly Leafmen. It’s a premise pregnant with philosophical potential. But then we discover that the wise queen of the Leafmen is voiced by Beyoncé Knowles, who also contributes a song to the soundtrack. It’s one of numerous examples of Blue Sky attempting to copy the marketing of their peers but lacking the slickness to fully deliver. The queen picks her heir from a selection of unimbued leaf pods, but dies during an attack by the Boggans. She passes on the responsibility of seeing the pod to bloom to a human girl named C.K. (Amanda Siegfried), who is miraculously shrunk to insect size in the process. Should the pod flower in darkness, it will become a tool of destruction. It’s hard to say if the half dozen writers have the Boggans in mind as representations of the evils of industrialisation, since their destructiveness appears simply one of rot and detritus. As such, one might expect a recognition somewhere of the need for balance between the two opposing forces (creation and entropy). If it’s there, it’s rather lost. As others have pointed out, the finished article is too derivative of other pictures, both in design and content (who could say that of The Dark Crystal, for all its faults?) There’s the jungle/forest idyll under threat (Ferngully: The Last Rainforest) and the (diminutive) people attuned to their natural environment (Avatar) who invite an outsider in, the key to their salvation (Avatar). Less aspirationally, the shrunken daughter and the goofy father/inventor are a direct lift from Honey I Shrunk the Kids. Throw in such stock tropes as the rebellious teenager, a couple of comic sidekicks (a slug and a snail), action-friendly set pieces (there’s an undisguised borrowing of The Phantom Menace’s pod race) and you get a movie whose personality has been focus-grouped into submission. So it’s fortunate for Wedge then, that the picture is structurally quite tight. Heavy weather is made of the grieving human family in the early stages (C.K. has lost her mother, her father is lost in his work), but once she has been shrunk (in a visually clever sequence that allows the viewer to travel with C.K., only realising that she has reduced in size as the process ends) Epic begins to hit its marks and eventually brings back the dotty father (whose life’s mission has been to confirm the existence of the Leafmen) to help win the day. The writing team weave some interesting ideas into the mix, in respect of both nature religions (the importance of the full moon and solstice are stressed as a means for the queen’s heir to reach germination) and whacky science (M.K.’s father believes humans look big and dumb and slow to a fly because each exists in a different dimension). But a strong theme such as the interconnectedness of things takes on all the profundity of a glib moral when filtered through the studio cookie cutter (“No one is alone”). There is the occasional moment you can’t imagine a Pixar picture permitting. For one thing, the tone is generally darker (most likely the reason for the overkill comic relief), but Wedge is also willing to roll with an anti-intuitive sequence such as the one where a cute little mouse revealed as a blood-curdling monster (there’s an amusingly morbid gag about the life cycle of a fruit fly too). The voice cast is typically bloated with star names, although in this case they tend not to draw attention to themselves (Beyonce and Chris O’Dowd aside). Colin Farrell is solid as the elder warrior, although Christoph Walz’s Mandrake is an unexceptional villain. Steve Tyler plays a “wise” glowworm. Naturally, he also contributes to the soundtrack. This is one of those movies of selective anthropomorphism; most of the characters are flora and fauna of the forest kingdom. There are talking plant people and madcap molluscs. Yet there are also dogs and birds and mice and deer that are just plain old creatures of instinct (it’s the Mickey Mouse/Pluto thing all over again). In some ways attempts by the lesser (as in, not the Big Two) animation houses to follow the success plan of the finely honed majors are all the more infuriating. The CGI-animated market place is well and truly a glut, but it appears to be dictating less, not more, variety. With Epic it’s the characters that suffer; they’re either unmemorable or over-familiar and you can be sure they’ve intentionally had any edges removed. Maybe Blue Sky is correct to think that way; maybe the kiddies wouldn’t want to see a version of Epic without talking slugs and snappy colloquialisms. It’s the same with the instant familiarity of the design work; the forest vistas are impressive, as are the uses of perspective between the macro and microenvironments, but there’s no personality to the character work. William Joyce appears adept at coming up with arresting ideas, so much so that its incumbent on those thinking about the bottom line to make sure they aren’t too arresting, too atypical, too disdainful of formula.